The fire at Notre Dame cathedral in Paris has caused its wooden spire to collapse, putting the entire frame of the 850-year-old landmark at risk. “Everything is burning, nothing will remain from the frame,” cathedral spokesman André Finot said, adding that the entire wooden interior is burning and will likely be destroyed, according to The Associated Press. In addition, the vault of the structure could also be threatened. No cause for the blaze was initially given, but according to AP, French media quoted Parisian firefighters that it may have been linked to a renovation project for the cathedral’s spire. Paris police said there were no reported deaths as a result of the fire and did not mention injuries. 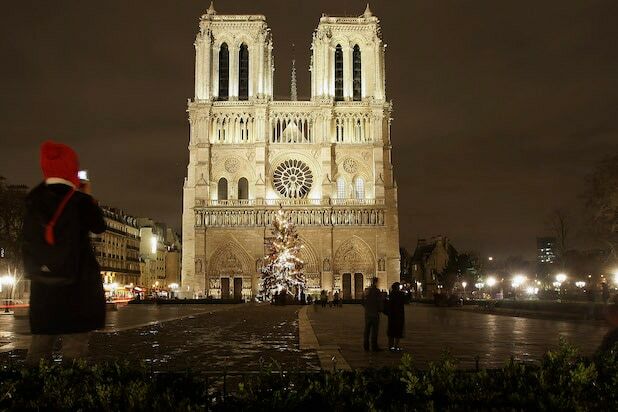 Deputy Mayor Emmanuel Gregoire told BFMTV that first responders were trying to salvage the art and other priceless items stored in the cathedral. French President Emmanuel Macron has arrived on the scene of the fire, according to CNN, accompanied by Paris’s mayor Anne Hidalgo, Prime Minister Edouard Philippe and first lady Brigitte Macron, as well as the Paris prosecutor. “Notre Dame of Paris in flames. Emotion for a whole nation. Thoughts for all Catholics and for all French. Like all our countrymen, I’m sad tonight to see this part of us burn,” Macron said in a tweet Monday. According to CNN, a Paris prosecutor has already opened an investigation into the cause of the fire.